It’s going to take a lot of Halloween candy and many cups of Joe to keep me on my toes this October 31st morning. There’s been a sleepless night in #Soxnation. It’s all the buzz, at least in this neck of the woods. What many in the sports world thought could not possibly take place somehow occurred on the night of October 30th, 2013. The Sox clinched the World Championship at Fenway Park. It took 95 years to dazzle the fans. Though there were two championships prior, winning it at Fenway seemed to matter most, especially this year. 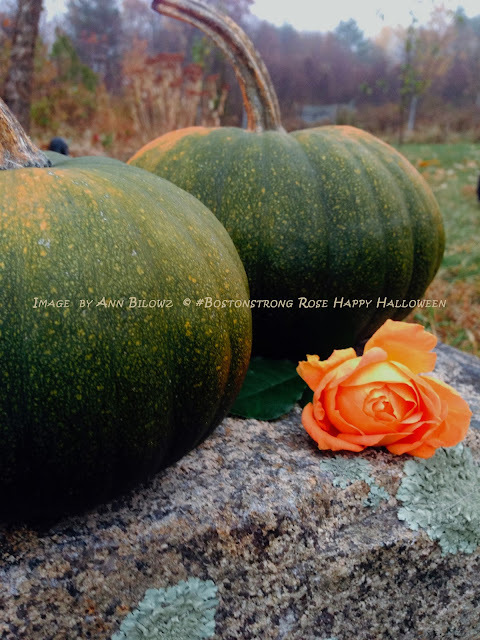 But for those who know about the story of my #Bostonstrong Rose, well, there it is up above, next to the chilly pumpkins this morning. Of course, one more image was necessary as it hung from its cane. But what to do with memories as Marcus Aurelius once said, “The memory of everything is very soon overwhelmed in time.” This Rose could not simply remain as just images in my posts. Robert Goddard, the author has this to say about photographs. “It doesn’t matter whether you look through a camera lens and press the shutter. It doesn’t even matter whether you open your eyes or close them. The pictures are always there. And so are the people in them.” But I wanted this special Rose to be more than just a photograph. But how does one save the memory of a withering flower? So I shuffle back in time to 1918. We, here in Boston know what that year means. It took 95 years to relive winning the biggest ball game in front of #soxnation. 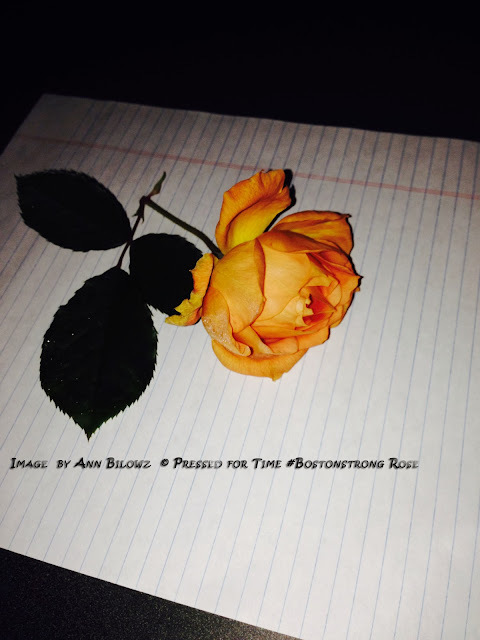 But how would folks like my grandparents ‘preserve this moment in time’ and keep this #Bostonstrong Rose just as it was – strong and intact, pressed in time? As an unknown author once said, "Love is like a rose. When pressed between two lifetimes, it will last forever." 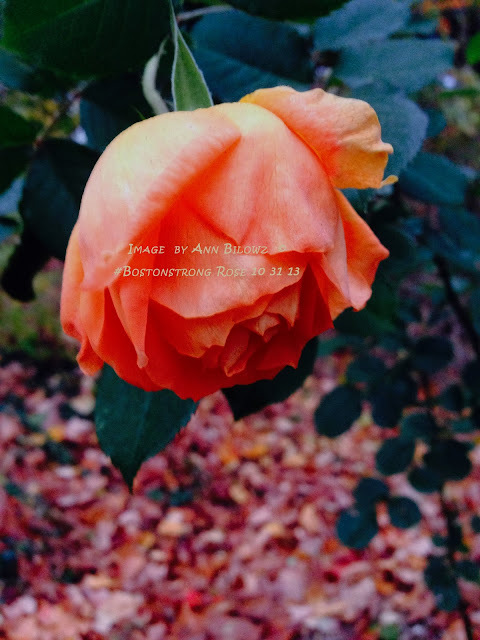 So here’s what I intend to do with this Rose. I plan on pressing it in time with these simple instructions. Pressing a flower is a perfect way to remember your garden. Can you remember the last time you found a pressed flower amongst a book’s pages? It was common when we were kids but now we might have to press it between a smartphone and a Kindle. Call me old fashioned but one of the influential reasons I love to garden is because of my grandmother and her love for Roses. But as a young child, I was also indoctrinated with my grandfather’s love for baseball, which carried down to my two brothers and spilled over to me. Gramps was a huge Sox fan. He never saw them win BIG again after that 1918 World Series but he continued to watch them every season and loved them just the same. So why relive traditions that took place in 1918? Here in Massachusetts, it’s more about what happened on the day of April 15th, 2013. That Marathon Monday shall always be pressed into our memories and the reason I believe the Red Sox were just destined to win. But it goes deeper than winning the biggest baseball game – it’s about spirit and faith. It’s when a Rose blossoms late in its season and continues to hold on – it’s what we call in #Soxnation, the #Bostonstrong. Hope you'll join in the tradition today and press a flower in time.